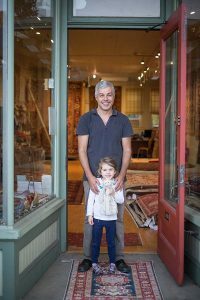 The two combined their talents to bring the world’s most beautiful and unique hand made rugs and textiles to Western Massachusetts through their retail store in a converted mill in Easthampton. In 2009 we expanded and moved to a more central location in downtown Easthampton. Jared’s experience comes through several years in marketing and sales for the area rug industry. Here he learned the importing and wholesaling business and discovered a love of hand made rugs and textiles while developing relationships with the world’s best and most respected rug makers. Today, these relationships have enabled us to give our customers access to the inventories of the country’s best importers whose rugs are created by the world’s most skilled weavers. Christine Quinn graduated from the Fashion Institute of Technology in Manhattan with a degree in Textile Design. She has worked for major companies designing fabric and textiles. More recently she has been a rug designer and color consultant for the area rug industry. Now her designs and sense of color are showcased in two lines of area rugs and a collection of alpaca throws made in Peru. Together our combined knowledge of the entire rug market, color and designs and our experience working with hundreds of Interior Designers allows us to perform comprehensive rug searches for the hard to find color or unique piece. The result is that our customers’ have access to the inventories that supply the country’s best stores, catalogs and Design Centers. Our goal is to provide our clients with the knowledge and the choices that will enable them to make an informed decision and find a rug they truly love. When this happens you will be surprised to find out that the right rug can make you feel good every time you, your family and your friends enter a room. A well chosen hand made rug becomes a family heirloom and 100 years from now will most likely still bring enjoyment and comfort to the lucky recipient while also reminding them of you. How can you put a price on that?